Many of the Early bird purchases have been shipped on Friday and rest will follow as soon as possible. The schedule of more IONICUBEs (4 axis type) are ahead of original schedule and we hope to have then all shipped within 2 weeks (also non-early birds)! Meanwhile the user guide of IONI & IONICUBE has been completed and available at Wiki. Please check it and leave a comment about the questions it leaves unanswered. While we wait the first production batch to arrive, it’s good time to make the documentation. Thankfully IONICUBE makes things so simple that it’s an easy job! If we succeed with Mach4 plug-in (and perhaps for some other software too), then it becomes even simpler. I made an quick installation guide for the new AC servo motors to the Wiki. 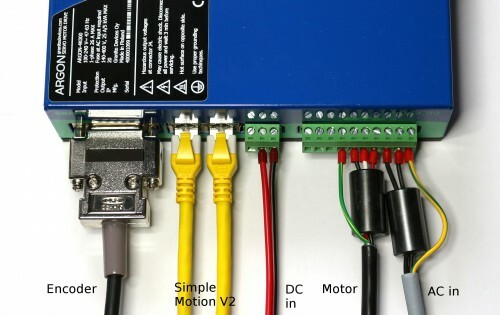 The site includes also pre-made drive configuration files so motors will operate straight out of the box once connections are made and file loaded to the drive. Remaining job for user is to adjust servo motor position or velocity control gain parameters because those depend on mechanical load properties and cannot be pre-configured without having the actual machine present. All motor & power wires plugged to drive and ready to go. Installation is really fast and simple operation compared to the earlier VSD series drives. 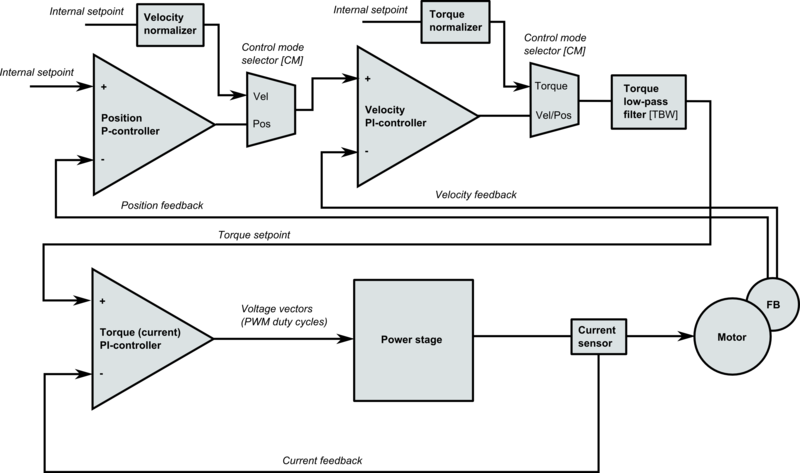 For those who are interested to see how servo drive internals are constructed, see the new Wiki article: Signal path of servo motor drive. 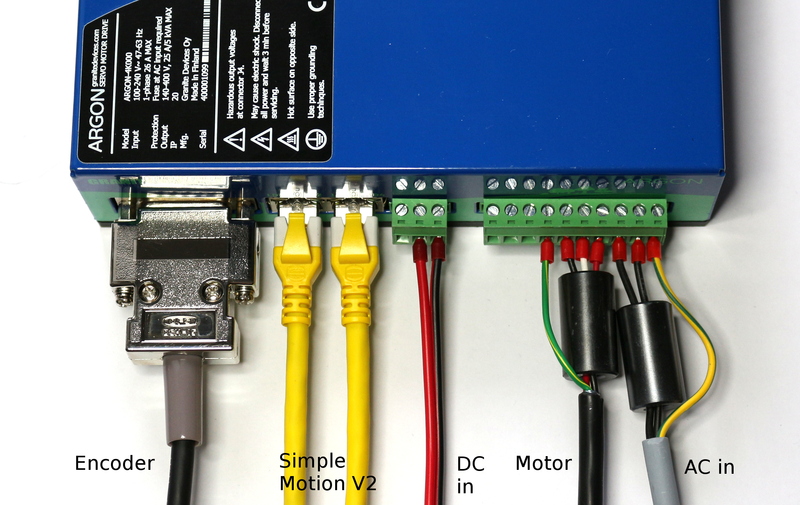 The diagrams presented in the article are useful when designing systems where servo drives are part of the system. The diagrams are also useful when designing custom code to Argon open source I/O side firmware. The I/O side microcontroller acts as provider of User setpoint as well as position and velocity feedbacks referred in the images. Rest of the illustrated logic lies inside the GraniteCore. Official Granity and Argon user guide now out! The first official release of Granity software, Argon user guide and Argon firmware has been just published! To begin, read through the Argon user guide, download Granity from here and the latest firmware from here. There may be (and probably is) some gaps in the documentation and software bugs at the moment, so be careful! Feel free to leave comments and even contribute to the Wiki directly. Just as a quick update: the first revisions of Argon user guide on wiki and Granity software shall be ready during this week which finally allows the real utilization of the drives. Stay tuned! In the other news: manufacturing of the next batch of Argons has been scheduled for this week, too. We should have more units available for shipping by the end of the next week (but I’m optimistic about it: could happen even on this week)! The gaps in the Wiki documentation for Argon are being filled every day and soon it shall be ready enough to allow actual use of the drives. The latest addition is a car analogy for servo tuning – find it here!